In baseball, a grand slam is a home run hit with all three bases occupied by baserunners ("bases loaded"), thereby scoring four runs—the most possible in one play. According to The Dickson Baseball Dictionary, the term originated in the card game of contract bridge, in which a grand slam involves taking all the possible tricks. The word slam, by itself, usually is connected with a loud sound, particularly of a door being closed with excess force; thus, slamming the door on one's opponent(s), in addition to of course the bat slamming the ball into a home run. The most recent grand slam was hit on November 1, 2016 (Game 6 World Series) by Addison Russell of the Chicago Cubs. Alex Rodriguez has 25 career grand slams, the most by any player in Major League Baseball history, passing Lou Gehrig's 23 on September 20, 2013. Meanwhile, Don Mattingly set the one-season record with six grand slams in 1987 – remarkably, the only grand slams of his major league career. Travis Hafner tied Mattingly's Major League record in 2006, while in 2009, Albert Pujols tied the one-season National League record of five grand slams set by Ernie Banks in 1955. 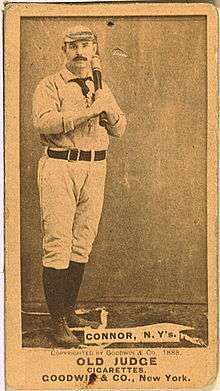 Several grand slams, the first being Connor's in 1881, consisted of a player hitting a walk-off grand slam for a one-run victory; some baseball observers call this an "ultimate grand slam". Ryan Howard was the most recent to do so in a 6-5 victory by the Philadelphia Phillies over the Houston Astros on August 7, 2014. Roberto Clemente is the only player to have hit a walk-off inside-the-park grand slam in a one-run victory; the Pittsburgh Pirates defeated the Chicago Cubs 9–8 on July 25, 1956 at Forbes Field, a park known for its spacious outfield. 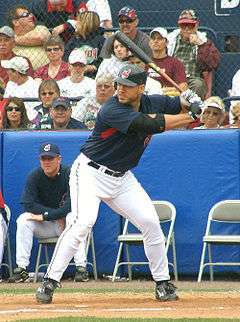 Also in 2006, Travis Hafner of the Cleveland Indians set a major league record by hitting five grand slams prior to the All-Star break, on his way to tying Mattingly for one season (his sixth was on August 13.) On July 16, Carlos Beltrán and Cliff Floyd of the New York Mets hit grand slams during an 11-run sixth inning against the Chicago Cubs, marking the eighth time two grand slams were hit in a team's at-bat (the fourth time in National League history). Four players hit a grand slam in their first Major League at-bat: Bill Duggleby (1898), Jeremy Hermida (2005), Kevin Kouzmanoff (2006), and Daniel Nava (2011). Kouzmanoff, Nava, and Duggleby hit theirs on the first pitch; Hermida's grand slam was in a pinch-hit at bat. 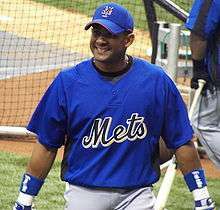 Fernando Tatís (pictured with the Mets) is the only player to hit two grand slams in the same inning, with the Cardinals, in 1999. The only major leaguer to hit two grand slams in one inning is Fernando Tatís of the St. Louis Cardinals, on April 23, 1999 at Dodger Stadium, with both grand slams coming off Los Angeles' Chan Ho Park in the third inning. Tatis was only the second National League player to hit two grand slams in one game, joining Cloninger. Park was only the second pitcher in major league history to give up two grand slams in one inning; Bill Phillips of the Pittsburgh Pirates did it on August 16, 1890, one to Tom Burns and one to Malachi Kittridge, but Park was the first to give up both to the same batter. Tatis had never hit a grand slam before in his career. Bill Mueller is the only player to hit grand slams from both sides of the plate in the same game, when he hit 2 on July 29, 2003 for the Boston Red Sox vs. the Texas Rangers. Robin Ventura is the only player to hit a grand slam in both games of a doubleheader, when he did so on May 20, 1999 for the New York Mets against the Milwaukee Brewers. In Japan's professional league, the feat of multiple grand slams in a single inning by a team has been accomplished three times; most recently on April 1, 2007 by José Fernández and Takeshi Yamasaki of the Tohoku Rakuten Golden Eagles. The Daiei Hawks accomplished the feat in 1999. On August 25, 2011, the New York Yankees, hosting the Oakland A's, became the first team in MLB history to hit three grand slams in one game. Robinson Canó, Russell Martin and Curtis Granderson took pitchers Rich Harden, Fautino de los Santos, and Bruce Billings deep, with each grand slam being hit in a different inning. Coming back from a 7−1 deficit, the second grand slam gave the Yankees their first lead of the game; they went on to win 22–9. On July 13, 2014, Buster Posey and batterymate Madison Bumgarner of the San Francisco Giants hit grand slams against the Arizona Diamondbacks. It marked the first time in Major League Baseball history that batterymates hit grand slams in the same game. "Get out the rye bread and mustard, Grandma, it is grand salami time! "- used by longtime Seattle Mariners lead commentator Dave Niehaus from the 1995 season until his death in November 2010. Currently used by Niehaus' longtime partner Rick Rizzs. 1953 Game 5, October 4 Mickey Mantle, New York Ebbets Field Russ Meyer, Brooklyn 3rd 6–1 11–7, W 3–2 NYY After a two-out error by Gil Hodges, a hit batter and a walk, Mantle hits reliever Meyer's first pitch out of the park. 1956 Game 2, October 5 Yogi Berra, New York Ebbets Field Don Newcombe, Brooklyn 2nd 6–0 13–8, L 2–0 BKN Berra's blast with 2 out is not enough to hold off the Dodgers in what becomes, at 3 hours 26 minutes, the longest 9-inning game in Series history until 1993. 1956 Game 7, October 10 Moose Skowron, New York Ebbets Field Roger Craig, Brooklyn 7th 9–0 9–0, W 4–3 NYY The Yankees score all their runs on 4 HRs to seal the Series, with Skowron's wallop on the first pitch with none out ending the scoring. 1960 Game 3, October 8 Bobby Richardson, New York Yankee Stadium Clem Labine, Pittsburgh 1st 6–0 10–0, W 2–1 NYY Richardson's HR with 1 out in the 1st starts him toward a Series-record 6 RBI. 1964 Game 4, October 11 Ken Boyer, St. Louis Yankee Stadium Al Downing, New York 6th 4–3 4–3, W 2–2 With men on 1st and 2nd, Bobby Richardson's error with 1 out while seeking a double play opens the gate for Boyer to hit his pivotal blast. 1964 Game 6, October 14 Joe Pepitone, New York Sportsman's Park Gordie Richardson, St. Louis 8th 8–1 8–3, W 3–3 With 2 out, Pepitone hits one onto the roof of the right field pavilion to help force Game 7. 1968 Game 6, October 9 Jim Northrup, Detroit Busch Stadium Larry Jaster, St. Louis 3rd 8–0 13–1, W 3–3 Northrup's HR with none out is the highlight of a 10-run inning which puts the Tigers ahead 12–0. 1987 Game 1, October 17 Dan Gladden, Minnesota Metrodome Bob Forsch, St. Louis 4th 7–1 10–1, W 1–0 MIN Gladden's HR with none out caps a 7-run inning which ends the Cardinals' 25-inning shutout streak. 1987 Game 6, October 24 Kent Hrbek, Minnesota Metrodome Ken Dayley, St. Louis 6th 10–5 11–5, W 3–3 With 2 out, Hrbek hits reliever Dayley's first pitch out of the park. 1988 Game 1, October 15 José Canseco, Oakland Dodger Stadium Tim Belcher, Los Angeles 2nd 4–2 5–4, L 1–0 LAD With 2 out, Canseco hits his first major league grand slam on a 1–0 pitch; but Kirk Gibson's walk-off home run wins it for the Dodgers. 1992 Game 5, October 22 Lonnie Smith, Atlanta SkyDome Jack Morris, Toronto 5th 7–2 7–2, W 3–2 TOR With 2 out, Smith's HR helps keep the Braves alive in the Series. 1998 Game 1, October 17 Tino Martinez, New York Yankee Stadium Mark Langston, San Diego 7th 9–5 9–6, W 1–0 NYY Martinez' 2-out HR follows Chuck Knoblauch's 3-run game-tying shot earlier in the inning. 2005 Game 2, October 23 Paul Konerko, Chicago U.S. Cellular Field Chad Qualls, Houston 7th 6–4 7–6, W 2–0 CHW Konerko's 2-out shot to left on reliever Qualls' first pitch gives the White Sox a 6–4 lead, but Scott Podsednik later wins it with a walk-off home run, after Houston tied it at 6 with two outs in the top of the 9th. 2016 Game 6, November 1 Addison Russell, Chicago Progressive Field Dan Otero, Cleveland 3rd 7–0 9–3, W 3–3 With the grand slam Russell tied a MLB record of 6 RBI by one player in one game, as well the most on a team on facing elimination from the World Series. This is the first MLB grand slam to happen in November. 1992 NLCS Game 2, October 7 Ron Gant, Atlanta Fulton County Stadium Bob Walk, Pittsburgh 5th 8–0 13–5, W 2–0 ATL With two out, Gant hits his first career grand slam to double the Braves' lead. 1995 ALDS Game 4, October 7 Edgar Martínez, Seattle Kingdome John Wetteland, New York 8th 10–6 11–8, W 2–2 After hitting a 3-run HR in the 3rd to cut NY's lead to two runs, Martinez hits another to center field to take the lead for good, finishing with a postseason-record 7 RBI. A walk, bunt single and hit batter had loaded the bases with none out. 1996 ALDS Game 1, October 1 Bobby Bonilla, Baltimore Camden Yards Paul Shuey, Cleveland 6th 9–3 10–4, W 1–0 BAL After two walks, a single, a sacrifice fly and a hit batter, Shuey enters the game and is greeted by Bonilla's blast with two out. 1996 ALDS Game 3, October 4 Albert Belle, Cleveland Jacobs Field Armando Benítez, Baltimore 7th 8–4 9–4, W 2–1 BAL After Orioles starter Mike Mussina is controversially pulled after six innings, Jesse Orosco walks the bases loaded and is replaced; Belle crushes an 0–2 pitch with none out to keep the Indians alive in the series. It would be Belle's final hit as an Indian. 1997 NLDS Game 3, October 3 Devon White, Florida 3Com Park Wilson Álvarez, San Francisco 6th 4–1 6–2, W 3–0 FLA With two out, Florida gets a pair of singles and a walk before White hits Alvarez' 113th pitch to left field. The Marlins advance to their first NLCS, in their fifth year of play. 1997 ALDS Game 3, October 4 Paul O'Neill, New York Jacobs Field Chad Ogea, Cleveland 4th 6–1 6–1, W 2–1 NYY After starter Charles Nagy walks the bases loaded, O'Neill greets Ogea with a blast to center field with two out as rain begins to fall. 1998 NLDS Game 1, September 30 Ryan Klesko, Atlanta Turner Field Matt Karchner, Chicago 7th 7–0 7–1, W 1–0 ATL Klesko's homer with two out, following three walks, secures the win for the Braves. 1998 ALCS Game 6, October 13 Jim Thome, Cleveland Yankee Stadium David Cone, New York 5th 5–6 9–5, L 4–2 NYY Thome's shot into the third deck with one out pulls the Indians within a run, but it isn't enough for the defending AL champions as the Yankees advance to the World Series. 1999 ALDS Game 2, October 7 Jim Thome, Cleveland Jacobs Field John Wasdin, Boston 4th 11–1 11–1, W 2–0 CLE After a 6-run 3rd inning highlighted by Harold Baines' 3-run HR, Thome makes it a blowout, ending a 5-run inning with a two-out shot and becoming the first player to hit two postseason grand slams. 1999 ALDS Game 5, October 11 Troy O'Leary, Boston Jacobs Field Charles Nagy, Cleveland 3rd 7–5 12–8, W 3–2 BOS O'Leary homers with one out to give Boston the lead, and later hits a 3-run HR in the 7th to break an 8–8 tie and send the Red Sox to the ALCS; both homers come after intentional walks to Nomar Garciaparra. 2004 ALCS Game 7, October 20 Johnny Damon, Boston Yankee Stadium Javier Vázquez, New York 2nd 6–0 10–3, W 4–3 BOS Damon homers to right on reliever Vázquez' first pitch with one out, staking Boston to an early lead; he homers again in the 4th for an 8–1 lead as the Red Sox complete their comeback after being down 3 games to 0. 2005 NLDS Game 4, October 9 Lance Berkman, Houston Minute Maid Park Kyle Farnsworth, Atlanta 8th 5–6 7–6, W 3–1 HOU With one out, Berkman hits an opposite-field homer to left on a 2–1 pitch to bring the Astros within a run; it is the first time that two grand slams are hit in the same postseason game. After tying the game in the 9th, the Astros win the series on Chris Burke's walk-off homer in the 18th, making it the second longest game in postseason history. 2007 NLDS Game 2, October 4 Kaz Matsui, Colorado Rockies Citizens Bank Park Kyle Lohse, Philadelphia Phillies 4th 6–3 10–5, W 2–0 COL Matsui's slam gives the Rockies a 6–3 lead on the way to winning the game 10–5 and giving Colorado a 2–0 series lead. 2008 NLDS Game 2, October 2 Shane Victorino, Philadelphia Phillies Citizens Bank Park CC Sabathia, Milwaukee Brewers 2nd 5–1 5–2, W 2–0 PHI Victorino's slam, the first in Phillies postseason history, broke a 1–1 tie after pitcher Brett Myers drew a two-out walk in a nine-pitch at-bat. Coaching visit to mound. Mike Napoli singles on a fly ball to center fielder Austin Jackson, loading the bases. Nelson Cruz hits a grand slam (3) to left field. Young, Beltre, and Napoli score on the home run. First official (see Grand Slam Single) walk-off grand slam in post season history. " 2012 NLDS Game 5, October 11 Buster Posey, San Francisco Giants Great American Ball Park Mat Latos, Cincinnati Reds 5th 6–0 6–4, W 3–2 SF After the Giants scored two runs in the inning, the bases were loaded for Posey. He hit a home run off the upper deck, giving the Giants a 6–0 lead they did not relinquish. The runs proved to be critical, as the Reds rallied to make the game close, but the Giants held on to win 6–4. The win completed the Giants' comeback from being down 2 games to 0 in the series, the first time that happened in NL Divisional play. The Giants won all three on the road, as the series became the second five-game series to not have a single win by a home team (after the 2010 ALDS between the Rangers and Rays). 2013 ALCS Game 2, October 13 David Ortiz, Boston Red Sox Fenway Park Joaquín Benoit, Detroit Tigers 8th 5–5 6–5, W 1–1 With the Red Sox trailing 5−1 in the bottom of the eighth, David Ortiz came up with the bases loaded and two out. Ortiz lined Benoit's first pitch into the right field bullpen sending outfielder Torii Hunter flying over the wall, tying the game at 5. The Red Sox would go on to win the game 6−5 in the bottom of the ninth on a walk off single by Jarrod Saltalamacchia. 2013 ALCS Game 6, October 19 Shane Victorino, Boston Red Sox Fenway Park José Veras, Detroit Tigers 7th 5–2 5–2, W 4–2 BOS In the bottom of the seventh inning, with the Tigers ahead 2−1 and Victorino down in the count 0–2 on well placed curve balls, he sent the third pitch (also a curve ball, but up in the zone) over the Green Monster. Victorino ended a 2 for 23 slump with this blast becoming only the second player ever, alongside Jim Thome, to have hit two post-season grand slams. Brandon Crawford, San Francisco Giants PNC Park Edinson Vólquez, Pittsburgh Pirates 4th 4–0 8-0, W n/a After singles by Pablo Sandoval and Hunter Pence and a walk to Brandon Belt, Crawford unloaded the bases with a 362-foot grand slam to right field, opening the game's scoring. His grand slam was the first to be hit by a shortstop in postseason history. 2016 NLCS Game 1, October 15 Miguel Montero, Chicago Cubs Wrigley Field Joe Blanton, Los Angeles Dodgers 8th 7–3 8-4, W 1-0 CHC After the Dodgers tied it in the top of the eighth, Montero's pinch hit grand slam breaks the tie. 1983 Fred Lynn, AL (California) July 6, Comiskey Park Atlee Hammaker, NL (San Francisco) 3rd 9–1 13–3, W In the 50th anniversary game, Lynn hits the first grand slam in All-Star history to right field on a 2–2 pitch with two out, capping a 7-run inning and virtually ensuring the AL's first victory since 1971 and second since 1962. Just before the pitch, NBC put on-screen a graphic indicating that there had never been a grand slam hit in All-Star history. Alex Rodriguez currently holds the record for most career grand slams with 25. Players in bold are currently active (as of September 27, 2016). Travis Hafner matched Mattingly's single-season record in 2006. ↑ Charlton, James. "The Chronology – 1871". BaseballLibrary.com. Retrieved 2007-10-29. ↑ "Ultimate Grand Slams". SI.com. 2002-05-18. Retrieved 2002-07-30. ↑ Stone, Larry (June 24, 2008). "Notebook – Grand slam by Felix Hernandez is one for the books". The Seattle Times. Retrieved 2008-12-30. ↑ "Hawks pound Shimizu, Marines". Retrieved 2007-04-02. ↑ Caldwell, Dave (August 25, 2011). "On a Long and Wet Day, the Yankees Win in Grand Style". The New York Times. and Mouat, Mike (August 25, 2011). "Yankees slam Athletics in grand fashion". Reuters. ↑ Slusser, Susan (August 25, 2011). "Yankees hit 3 grand slams to beat A's 22-9". San Francisco Chronicle. Hearst. Retrieved August 25, 2011. ↑ Parker, Rob (August 25, 2011). "It was a grand ole day at the ballpark". ESPN. ESPN Internet Ventures. Retrieved August 25, 2011. ↑ Pavlovic, Alex. "Giants' battery of Bumgarner, Posey provide charge heading to All-Star break". San Jose Mercury News. Retrieved 13 July 2014. ↑ "Audio: Relive Some Of Dave Niehaus' Best Calls". SBNation.com. 2010-11-11. Retrieved 2015-06-20. ↑ Full Nelson: Cruz belts walk-off slam in 11th" by T.R. Sullivan, MLB.com. Accessed Oct 10, 2011. 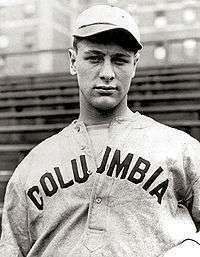 ↑ "Lou Gehrig Grand Slams". Baseball Almanac. Retrieved 21 September 2013.